WASHINGTON — Truck platooning has not yet advanced beyond the testing and development stage, but proponents and developers of the technology continue to explore ways to eventually deploy it in real-world freight operations. Industry and government experts from around the globe spoke here Jan. 15 at the annual meeting of the Transportation Research Board to outline their next steps to pave the way for platooning, which uses vehicle-to-vehicle communications to form convoys of two or more closely spaced trucks with synchronized braking and acceleration. Some developers, such as Scania, are turning their efforts toward semi-autonomous platoons where a lead truck with a driver onboard guides a train of unmanned follower trucks, thus reducing labor costs and addressing the driver shortage while also improving fuel efficiency. The government of Japan also is promoting truck platooning and automation as a means to address its own driver shortage and improve transportation efficiency. The country intends to demonstrate truck platooning without a driver in the following truck on a public expressway in 2020, said Naohiko Kakimi, director of the intelligent transport system and automated driving promotion office at Japan’s Ministry of Economy, Trade and Industry. 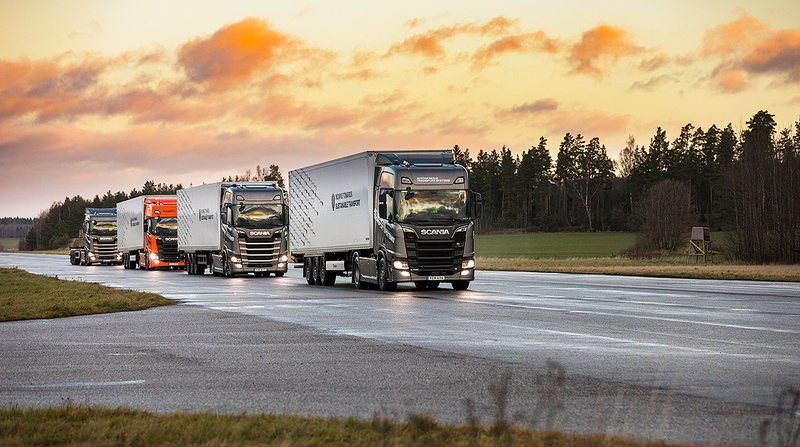 Scania, which is part of the Traton Group, has worked on platooning for 10 years and has changed its mindset from year to year during that span, Tornmalm said. Thus far, the testing and development of truck platooning has focused mostly on less automated platoons with a driver remaining in each vehicle. Even without removing any drivers, platooning still could reduce costs by boosting fuel economy through improved aerodynamics, but Scania is “not so positive” on that business case today, Tornmalm said. Daimler Trucks, the parent of Freightliner, also recently questioned the business case for platooning based on fuel consumption. At CES earlier this month in Las Vegas, Martin Daum, head of Daimler’s global truck business, said fuel savings from real-world platooning tests were not as high as expected and announced the manufacturer would not prioritize the technology moving forward. U.S. startup firm Peloton Technology, in contrast, said its truck platooning system has been able to deliver significant fuel savings through high utilization, close following distances and smooth control. “Peloton is seeing even better fuel economy results on public roads than we anticipated based on our previous and ongoing track tests,” CEO Josh Switkes said in a statement to Transport Topics. In the future, more advanced automated driving technology might enable drivers to operate longer and take advantage of more flexible driving and rest periods, but even that business case “is not strong enough” for platooning, Scania’s Tornmalm said. Instead, Scania intends to go one step further by pursuing platooning with a driver in the lead vehicle only. “In Europe, it’s difficult to find drivers who are willing to drive from the north of Europe to the south and east, to stay away from home many nights, and it becomes more and more expensive, so this is the business case that we’re focused on,” Tornmalm said. Scania envisions these platoons traveling on highways between logistics hubs to ease the flow of freight. However, effective platooning will require infrastructure investments such as electronic road signs and perhaps cloud-based traffic management systems and potentially dedicated lanes, Tornmalm said. Nonetheless, it will be “much easier” for society and government authorities to accept semi-autonomous platoons than independent driverless trucks, he said. “Scania believes that autonomous vehicles will take many years before they’re seen in huge-scale operation for commercial uses,” Tornmalm said. In Europe, researchers and truck makers are planning a new platooning project dubbed Ensemble. The goal is to accelerate the adoption of truck platooning by demonstrating interoperability among multiple vehicle makes, said Marika Hoedemaeker, senior project manager at TNO, a research organization in the Netherlands that is coordinating the effort. For the Ensemble project, each truck will always have a driver onboard, Hoedemaeker said. Nevertheless, the development work from Ensemble will still help provide a foundation for the eventual introduction of increasingly automated platoons, Scania’s Tornmalm said.